Photo courtesy of Jason Dixson Photography. (Harper). The 53-year-old former journalist and his wife, NBC news reporter Jamie Gangel, recently appeared at Hadassah’s national convention in Las Vegas. Q. You went from being a journalist to being a novelist. What was the most difficult part of the transition? A. My last job in journalism was in television news. I was executive producer of a unit at CNN that produced all the political talk shows—15 shows a week. I had a large staff. People were talking to me constantly, constantly, seven days week. Suddenly I was working alone and it was very quiet. And not only was I trying to write a novel, which is never easy, but I had to decompress from my previous life. Now, I can’t imagine doing anything else. But at first, when the world sort of stopped and it was just me alone [with] my work, it was something of a shock. Q. What would you call your genre? Are your books spy novels? Thrillers? A. I would call my genre, broadly, international intrigue. My lead character, Gabriel Allon, works for [the Israeli] intelligence service. The plots involve real-world intrigue and intelligence operations but not the classic cold war spy novel by any stretch of the imagination. On top of that, my character is an art restorer and many of the stories have a large art component. They blend genres. I think that is one of the reasons I attract readers who might not necessarily pick up a spy novel. Q. Where do you get your ideas for plots? A. I am a former journalist. I am endlessly fascinated by the world around me. Plots generally flow from what is going on in the world at the time I am writing. Sometimes I work from a starting point and open scenes and build the plot that way. Sometimes I see other aspects and build the story backwards. The operative word is build. It has to be constructed. I don’t have a voilà moment and the entire book appears before me. Q. How long does it take you to research and write a book? A. I am constantly researching. I try to travel everywhere my books take place and I do an enormous amount of reading about the places I can’t visit. For example, I was lucky enough to get a private tour of the former KGB headquarters in Moscow, and I try to walk down every street I write about. That said, I don’t have a lot of time because I write a book a year. I have about seven months to write the book. I love to rework and tinker and I take every minute and squeeze every ounce out of the process to get the book the way I want it to be. Q. How accurate are your depictions of Israeli and other spy agencies? In one novel, you have an account of slipping contaminated material into Iran’s nuclear centrifuge. Is it real? Is it imagination? Is it even feasible? A. We actually did do that. I was probably the first person to write about it. The action against the Iranian nuclear program was largely carried out by a triumvirate of MI6 [British intelligence], the CIA and the Mossad. Military action was always on the back burner but, for the last several years, we built a covert war to make it as difficult as possible for the Iranians. One of the things we did was to try to get inside their nuclear supply chain. Israeli, U.S. and British intelligence learned quickly that it was sometimes better to let material get through to the Iranians than stop it. You can sabotage pieces, and we did that. We also did other things like feeding them flawed nuclear blueprints and faulty electrical switches to make the factories run poorly. Q. There are a lot of references to the Holocaust and World War II in your books. Are these personal interests? A. One of the wonderful things about the Allon series is it allows me to selfishly pursue all the things I am interested in. Art, the history of the Middle East, the history of World War II and the Holocaust. All those things flow through the character of Gabriel Allon. His grandfather was a famous artist who was murdered in Auschwitz. His mother was a survivor of Birkenau. One of the greatest compliments I get is from survivors and their families who tell me I could have been writing about their families. It is not an easy topic to write about, but it is one I have always cared deeply about. And be sure of one thing, the Second World War and the Holocaust still hang over the Mossad. This is an organization dedicated to making sure it never happens again. Meir Dagan, the ex-Mossad chief, famously had a picture hanging in his office of one of his relatives just moments before being killed by an Einsatzgruppen [mobile killing units]. Before going out for an operation, Dagan would call team members in to his office to see the photograph. It was his way of reminding them what they were fighting for. Q. 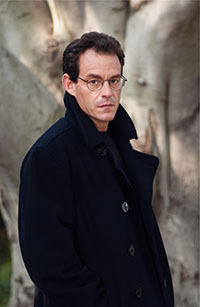 You have written 17 books, 14 starring Gabriel Allon. They are all best sellers. Do you ever think about creating another lead character? A. At some point, I will write a different book. I’m not sure when. I’m not sure how. That said, Gabriel Allon has a legion of devoted fans. There’s a lot of Allon-iacs out there. When I mention writing another character, readers get very upset, so it is a tough decision. Q. Do you have favorite books? Favorite writers? A. I am a literary novelist masquerading as a thriller writer. My first love is all literature. My favorite books are 1984 and The Great Gatsby. I love Graham Greene. Q. Do you find it easier to write the more you do? A. Anyone who does this for a long period of time feels conflicting emotions about their craft. I try to do something better each time out as a writer. I work very hard at my books. I don’t really do much else in life other than write. One thing I never do is spend much time reading reviews, even good reviews. It’s not really helpful, in my humble opinion. One thing I always do is write for a very small audience. There are a couple of people I lean on—my wife, Jamie Gangel, and an old friend, Louis Toscano, who has been editing me since I was a cub reporter. Q. Can you give us a brief biography? A. I was born in 1960, in Michigan. My family moved to California when I was 7. I graduated from California State University Fresno with an undergraduate degree in journalism/political science. I attended San Francisco State University to pursue a graduate degree in international relations but I got hired to work for United Press International so I couldn’t complete my degree. It’s one of the few things in life that I didn’t finish, and it bothers me to this day. I met my wife when we were both reporters covering the Middle East. We married in 1988 and lived in Washington, D.C. We have 19-year-old twins, Lily and Nicholas, who just finished their freshman year at Yale. We moved to Florida last year and love looking out at the ocean every day. Q. How important is Judaism in your life? A. Judaism is a big part of my life. I belong to a Reform congregation. But I would say there’s very little Judaism in the books actually. You will see celebrations of Shabbat but the characters, like many Israelis and I would hazard to guess, most of the people who work in Israeli intelligence, are very secular. Gabriel’s wife is the daughter of an Orthodox rabbi but they tend to reflect the more secular Israelis. I’m not saying there isn’t a spiritual component and there definitely is, much of it carefully hidden in subtext. Q. Do you belong to any Jewish organizations? A. I am a member of the U.S. Holocaust Memorial Council, having been appointed in 2009 for a five-year term. I love the museum. I’ve had many wonderful things happen to me because of my work. But being able to serve in the council has meant a great deal to me. Q. Do you see your books being made into movies? A. We are approached by producers and studios every week and we are considering some offers right now. Everyone says the books are cinematic and readers always ask about movies and have casting suggestions. But I am Hollywood’s worst nightmare. I am very protective of my books and I am not interested in making a movie [just] to make a movie. I want to ensure that we make a great movie. If we get that chance, that’s wonderful, and if we don’t, that’s O.K. I often think the characters should just remain on the page and in the imagination of readers. I agree. Don’t ruin Gabriel by turning the books into movies. Let Gabriel and Ari Shamron live on forever in our imaginations. My heroes. Great bodhisattva warriors! I just want to say that I’ve read most of the Allon books, and I’m thrilled when I see a new one. I hope that we see many more adventures by this artist/agent before Mr. Silvia turns his talents to another character and style. Daniel Silva can do whatever he wants as far as I am concerned . Let him alone so he can be with his stories forever more. 1 AM AN AVID READER. I JUST READ MR. SILVA’S LATEST NOVEL “FAMILY OF SPIES”…..AND MY VERY FIRST OF HIS BOOKS. WELL….WHERE HAVE I BEEN? LOVED THIS BOOK AND AM GOING RIGHT BACK TO BARNES& NOBLE TO FIND ANOTHER ONE. I LIKE TO MIX UP GENRES HOWEVER. WHO DOESN’T LOVE GABRIEL ALLON? AM SO HAPPY I FINALLY “FOUND” THIS SERIES. THANK YOU! I am in awe of your talents. Please, continue telling us Gabriel Allen stories. What a fascinating character you have created. Thank you! I am in awe of your talents. Please, continue telling us Gabriel Allon stories. What a fascinating character you have created. Thank you!